Thursday January 25th 1894 I was all the forenoon thawing things out. It was a very cold night. My plants froze. I went up town and to the Missionary meeting in the afternoon. I got home to get supper by five oclock for Mrs Bivens and Percy. They started away on the 6:40 train. Friday January 26th 1894 I was busy about the house all forenoon. I brought down some of the things Mrs B-- used up stairs. After dinner Will took me over to Hatties. They were just ready to come away so \we went out to Marys to spend the afternoon. I got our suppers over and read all the evening. Saturday January 27th 1894 I was busy till tow oclock with my Saturdays work. I had it all done in good order at that time. I then wrote a letter to Mrs Fuller and went up town to mail it. I called on Mrs Carney and Fanny Graham. I got supper when I came back and did mending in the evening. I was up town a few moments in the morning for some things. 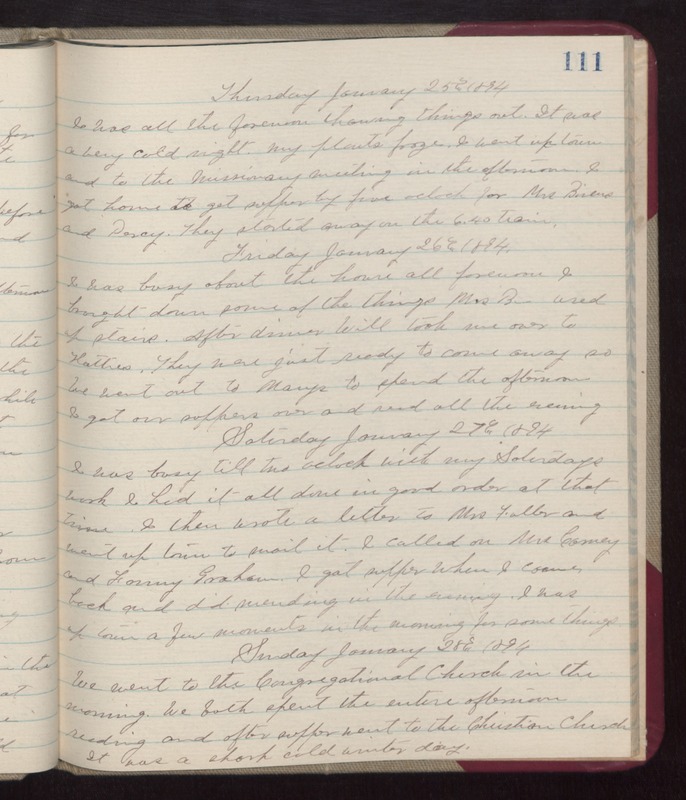 Sunday January 28th 1894 We went to the Congregational Church in the morning. We both spent the entire afternoon reading and after supper went to the Christian Church. It was a sharp cold wintry day.